World’s first ever digital focus - Dynamically adjust the width of your beam from 12º to 270º without any moving parts. 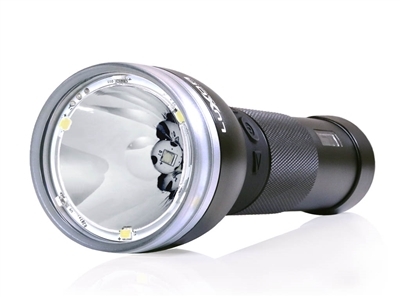 850 Lumens at your fingertips - 7 strategically placed CREE LEDs pack the power of a traditional 60 Watt bulb. Portable power bank - 5000mAh battery with reverse charge allows to charge your smart devices on the go. Digital OLED display - Never suffer battery anxiety again. 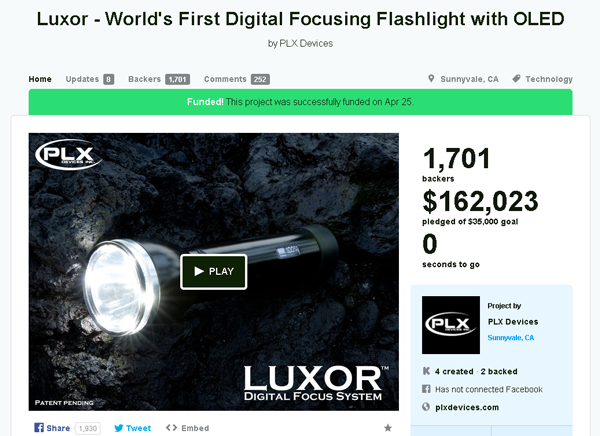 Monitor light output, battery life, battery health, and more on Luxor’s digital OLED screen. 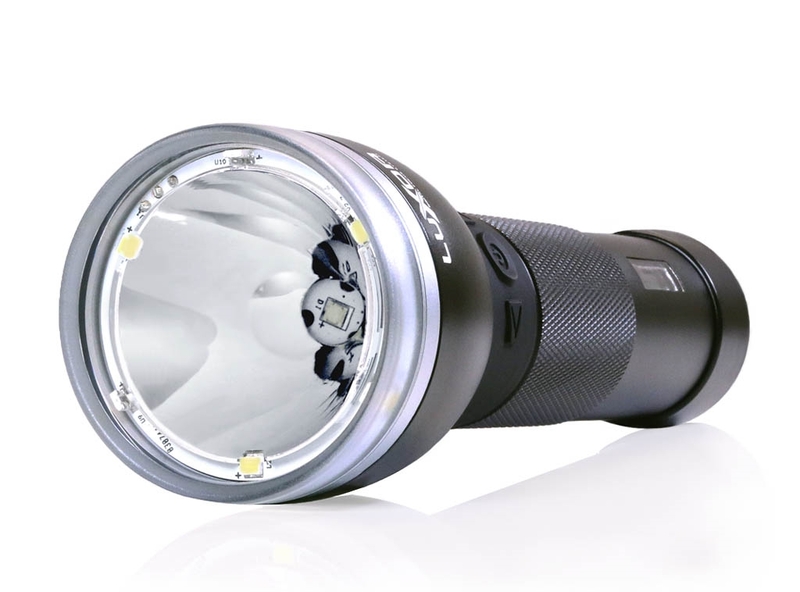 7 ultra bright Cree LEDs emit a true 850 lumens, brighter than your traditional 60 Watt bulb. High contrast OLED screen displays current light mode, brightness, throw, charge remaining, battery health, and more. 4 digital soft touch interface buttons allow you to agilely navigate menus and modes. 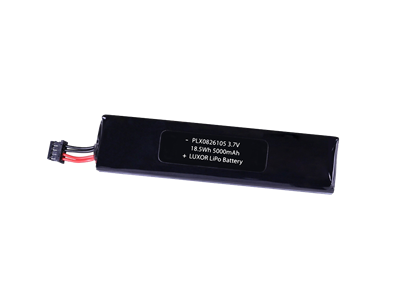 5000mAh rechargable lithium polymer battery gives you hours of active use. 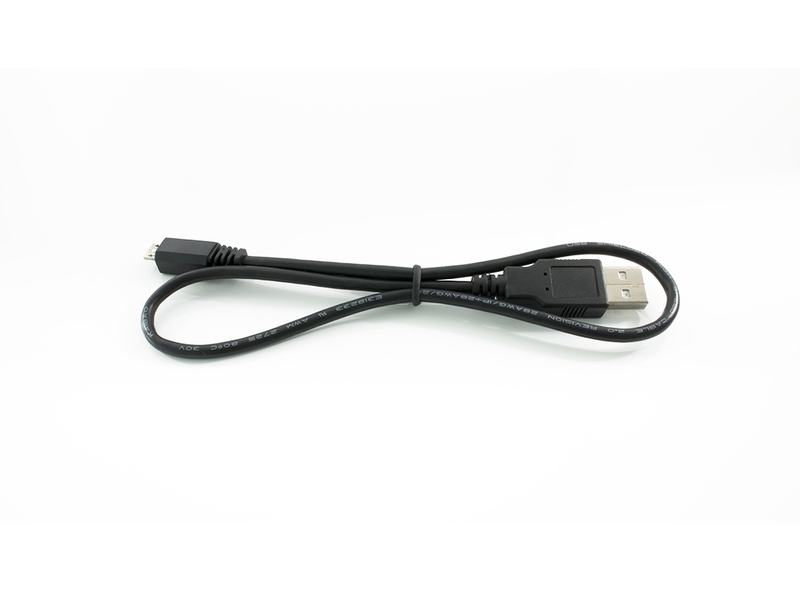 Micro USB charging port allows you to charge your Luxor with standard micro usb charging cable. Reverse charge turns Luxor into a powerbank to charge your smart devices on the go. Aluminum body / high impact resistant polycarbonate lens make Luxor as durable and rugged as it is versatile. Auto Focus automatically detects where Luxor is pointed and delivers the perfect light for that situation. 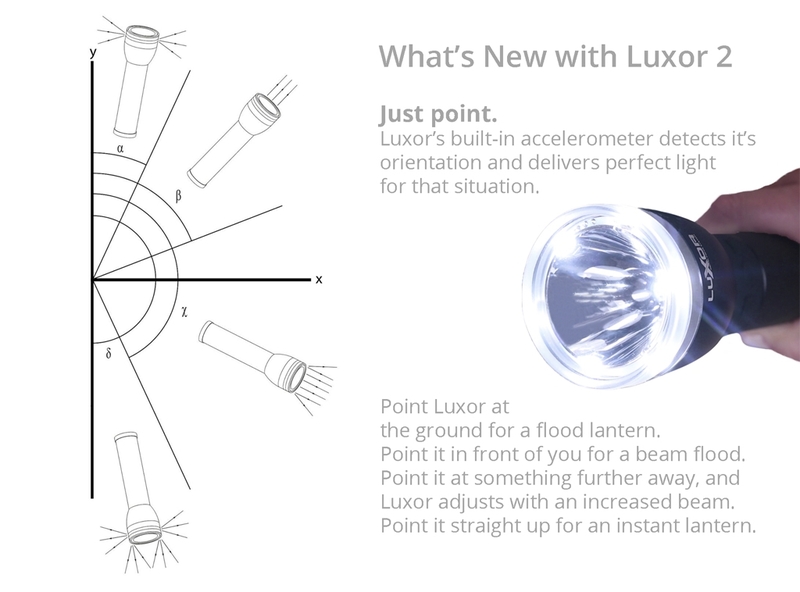 Pointing Luxor at the ground for the flood, in front of you for a flood beam, further away for greater throw, and straight up for an instant lantern. Virtual Focus allows to precisely adjust the width of your beam from 12º to 270º and everything in between simply by turning your wrist or using the left and right buttons. Beam Flood delivers a powerful traditional forward facing beam. 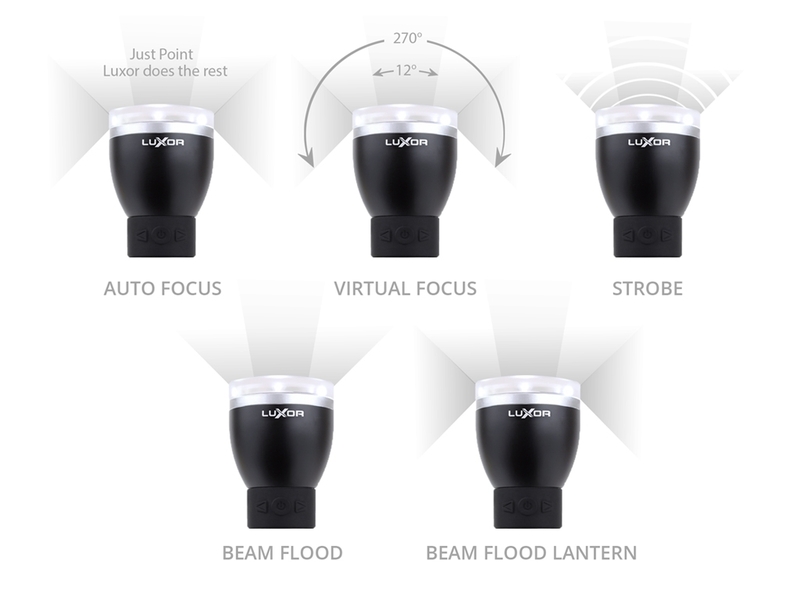 Beam Flood Lantern utilizes all 7 of Luxor's LED's for maximum illumination. Never suffer from battery anxiety again. 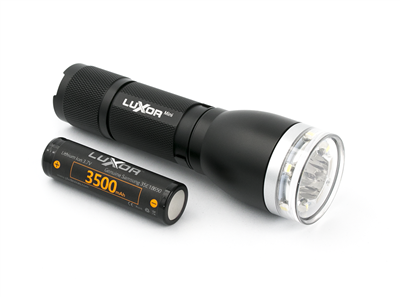 Luxor's organic LED screen provides you with all remaining charge and battery health. 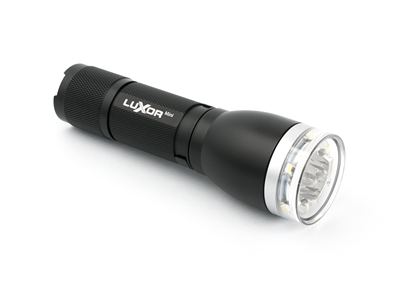 Rated IPX7 waterproof, Luxor has been rigorously tested for confidence in any environment. 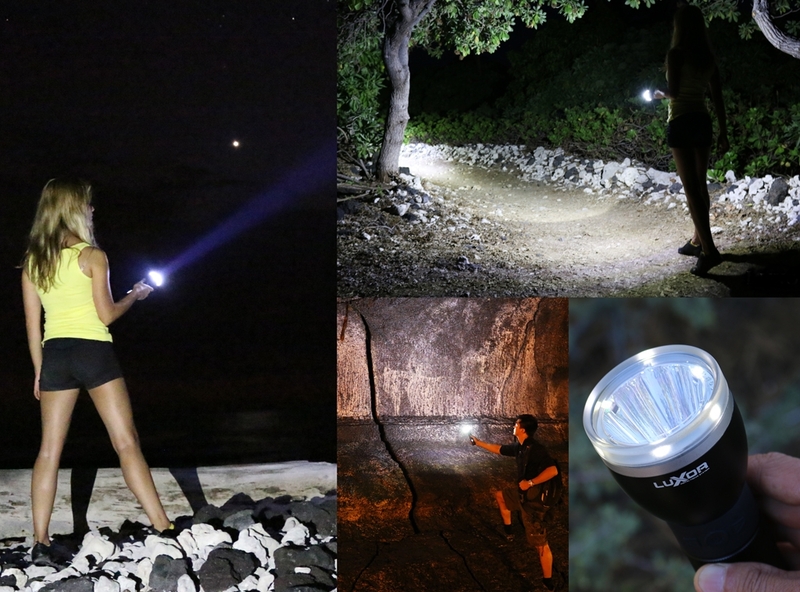 I really like the Luxor 2 & 1 flashlights. They're kind of what I hoped for, have long battery life, and great usability, and aren't too heavy. I felt I had to write this review because a) Luxor 2 is great and b) so is the Luxor 1. 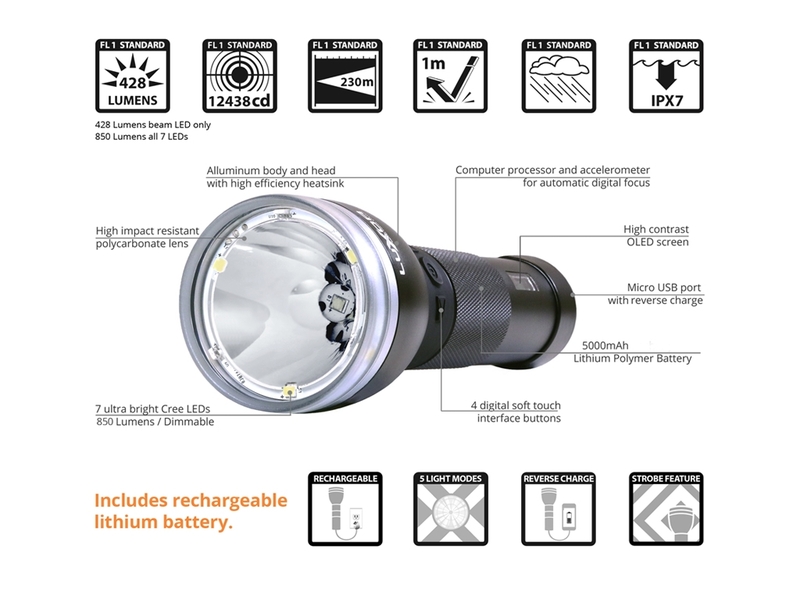 The features available on this flashlight are pretty neat. Although, for what I use the light for auto focus is not very useful. Also, I would recommend a setting in the future for just beam in addition to beam/flood and beam/flood/lantern. The battery health dropped off significantly after the first two charge cycles I put the light through. 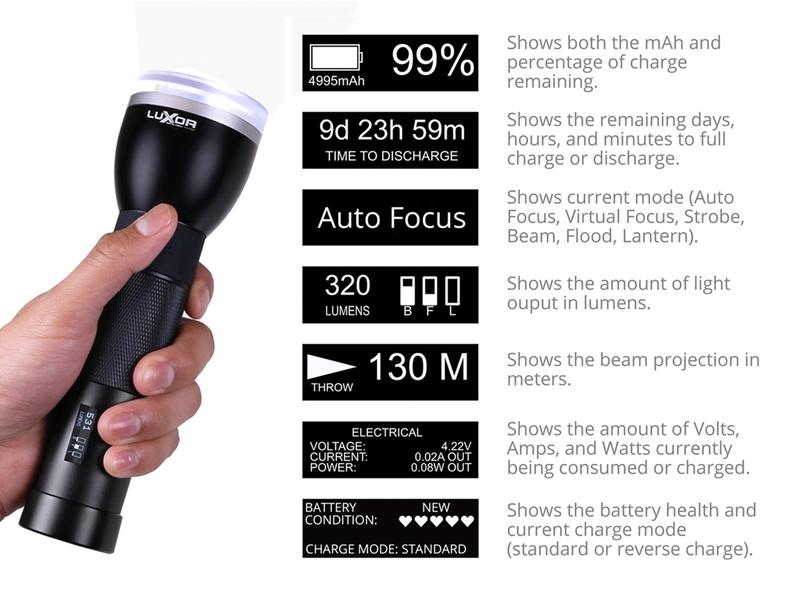 It still seems to be putting out the same amount of light, but needs to be charged more frequently. (I re-read the literature on the light and it is recommended to not allow the charge to drop less than 20% because it can degrade battery health) I'll be getting a backup battery just in case. 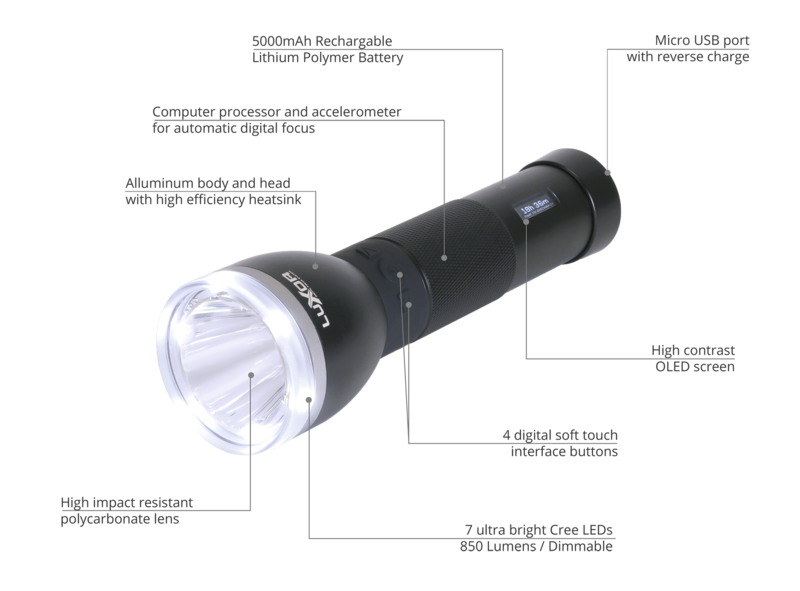 I use this light aboard a Navy ship and it has held up to drops and banging into solid steel beams, equipment, etc. 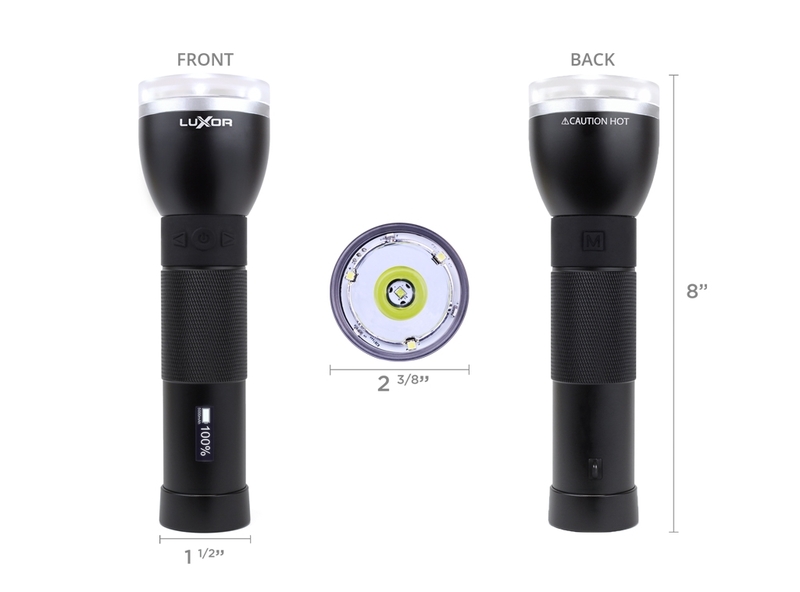 I was worried about the method of attachment of the head of the flashlight to the body and that it seemed to be made out of plastic, but the connection has held up well for the last six months after several drops from 6 feet or so. 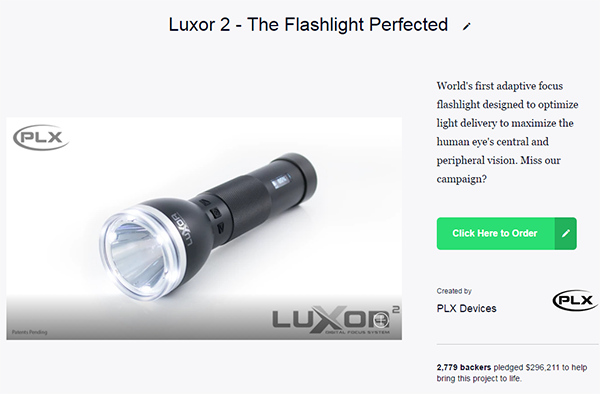 I'm a Kickstarter backer and I've been using my Luxor 2 for about a week and this literally puts all of my other flashlights to shame. It's great around the house, it's great in the backyard shed and I love the features. It will take some time to get acquainted with everything but I'm supremely happy with my light. The light output seems brighter than some of my other claimed 2000 lumen lights. auto focus is cool, snappy and quick. I also like the fact that you can manually set it up to however you like. 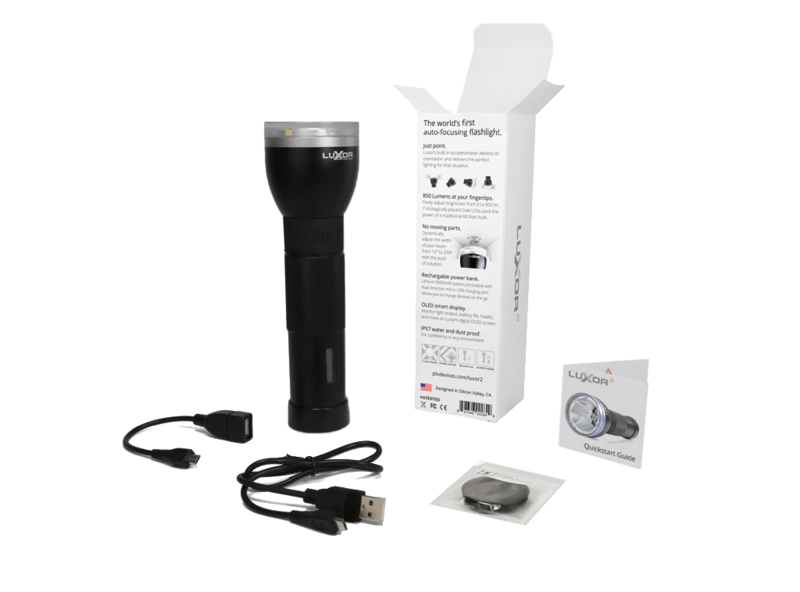 This is a must buy light and a must keep for pretty much all of your lightning needs. Nice job with this one PLX devices! The auto focusing is super awesome. I love being able to walk through my house at night with pointing the flashlight down and it evenly lights up the ground and everything around me evenly, and when I go outside I just point it horizontal and it automatically adjusts to the beam. You can go to pointing with a beam straight out to lighting up the ground in a second with the appropriate light for the situation. Not too mention the LED screen is awesome, I love the fact that it shows the percent of battery left as well as the mAh that are left.